WASHINGTON—Explaining that the lifetime appointment would provide vital structure and purpose, newly sober Brett Kavanaugh introduced his Alcoholics Anonymous sponsor who claimed that the judge needs this Supreme Court seat as part of his recovery, sources confirmed Monday. “Listen, Brett checks in with me every morning, and I know he wants to make things right, but he’s vulnerable right now, and I’m afraid you’re opening him up to a relapse if he doesn’t get this gig on the Supreme Court,” said sponsor and recovering alcoholic John Palladino at a press conference, adding that losing this opportunity could send Kavanaugh into a spiral of negative and compulsive behavior not seen since his days at Yale. “We need to support him in his sobriety, because you saw how hurt and how angry he got just talking about his drinking problem the other day, and I fear for what it could do to his poor family if he doesn’t get this seat on the highest court in the land. 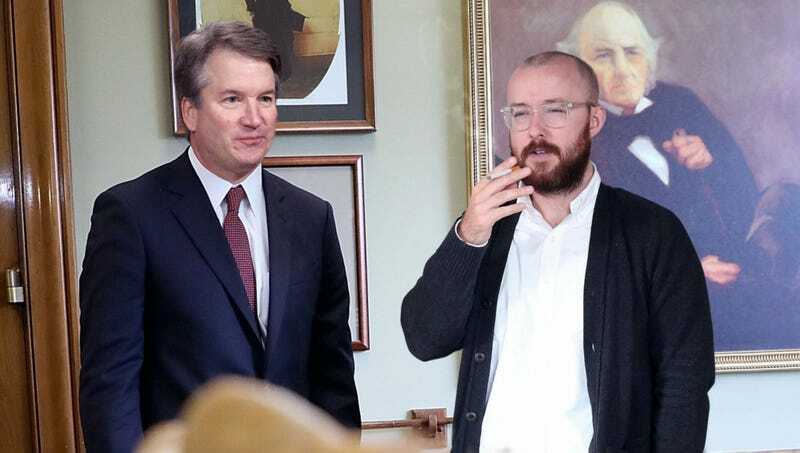 Brett just got his 10-day chip and really needs our encouragement and help, and maybe a place to crash for a bit while he gets back on track.” At press time, Kavanaugh was using his 10-day chip to play quarters.